Become a Reseller of PreMadeKB. Sell it to your customers and earn money. Purchase Readymade Professional Knowledgebase Articles for WHMCS, Blesta, ClientExec, HostBillApp and Wordpress. 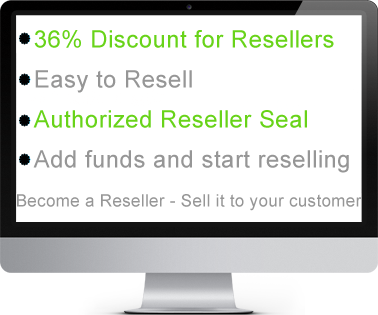 What are the requirements to become an authorized reseller? First you need to purchase at least one license from us at normal price. You can use a coupon for this and open a ticket. Then, we will add you to our Reseller Group and you will be able to purchase our KB at a 36% reseller discount price. Can I get an Authorized Reseller Seal? Only our Authorized Reseller will get a seal that can be installed on your site. This will allow you to proudly display that you are an Authorized Reseller of PreMadeKB on your site. The Authorized Reseller Seal will be generated for your domain after we accept you as a reseller and provide details in a welcome email. Q1. What is the price of your KB? - The normal price is $60 and the price for our resellers is $38. These are one-time fees. Q2. What is the upgrade price? - $15/Yearly. For the first 6 months the upgrade/update is free. Q3. What if my customer wishes to upgrade the PreMadeKB version? - The cost of upgrade after 6 months from the purchase date is only $15 for 1 year. However, you can set your own price for upgrade and charge your customers according to your price policy. Q4. How does reselling works? - Purchase KB from us and we will prepare it for you and send you the download link. Then you will need to give it to your customer, who has purchased KB from you. Q5. Do you provide support for the end customer? - Yes. If you allow it, your customer can directly contact us. Q6. If I purchase 2 licenses and after 6 months the upgrade expires, would I need to purchase an upgrade for 2 licenses or just for one? - You will need to purchase an upgrade order for both licenses separately but there is an option. If your customer does not purchase an upgrade after 6 months, you are not forced to purchase an upgrade from us. Q7. I purchased WHMCS KB but want to switch to Blesta? - It iss possible that your customer wishes to switch to different billing system and we allow it. However, the maximum number of changes per license is 1, and after that, if you wish to switch to a different billing system, you will need to pay $20. However, we do not allow frequent changes due to risk of abuse. - Currently our KB supports WHMCS, Blesta, ClientExec, HostBill and WordPress. Q9. I purchased a Blesta KB. Can I also get a KB of WHMCS? - No. If you want both, you need to purchase them separately. - If you are our reseller, the discounted price will be directly applied to your invoice. What it means is that when you place an order, the order form will display the normal price. However, the invoice will be generated with a 36% discounted price. Q11. How can I start reselling? - First you must purchase our KB at a normal price and then open a ticket with us. We will then add you to a reseller group with your domain name from which you would want to resell our KB. We will provide an Authorized Reseller Seal and additional details on how to purchase our KB, the amount of the discounted price, how to resell, etc.